Hello! I'm so glad I had a chance to play along with this week's Belles 'n Whistles Challenge which was Lace and Frills! I was able to use another adorable image borrowed from my mom called Fairy Play~thanks mom! I paired her with my favorite halloween paper from Echo Park Paper called Happy Halloween, and a sentiment from the PTI set Been Boo'd. I added some gorgeous 1.5" White Crochet Lace from Really Reasonable Ribbon and some Prima flowers and roses for my frill. The layout is this week's Jen's Sketch For You To Try. Thank you so much for looking, and enjoy the rest of your weekend! Beautiful card.. I love it. Wow, Kerri, this is gorgeous! What a wonderful halloween card Kerri. Great colours and the image is so sweet! Kerri, This is an adorable image. I just love your card. the lace,pearls and flowers are perfect. Wonderful coloring as well. Thanks for sharing your talent. GORGEOUS girlie! LOVE this image and your coloring! I also LOVE that paper (one of my current favs) and that crocheted lace is AWESOME!!! This is just adorable Kerri!!! I love this sweet image and the colors and details are all so pretty! Love the placement of your sentiment as well! thanks so much for joining us at Belles and Whistles! This is gorgeous Kerri!! 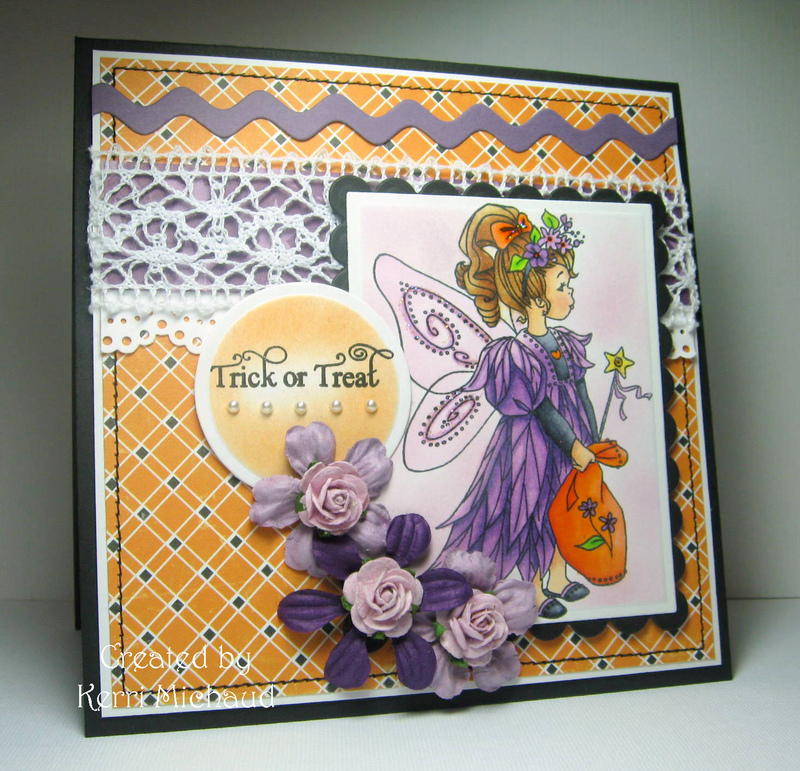 I so love your adorable coloring of this image, the lace, and your paper and colors.The flowers and layout is perfect!! I may have to play with that sketch this week! How fun to be able to use an image from your Mom. My mom does not stamp...my sister does though but only with SU. It is so wonderful when you and Mom enjoy the same hobby! Love the card you created! So beautiful! The lace look so pretty, love the ric rac element you added too! (sigh...) I just love the orange and purple. And your sentiment looks like it glows!! So pretty. Did you sponge that or airbrush? Such beautiful lace and I adore your coloring!! Yowee! This is stunning! I love your color combination and your details :) Gorgeous coloring too. Thanks for joining the Belles N Whistles Challenge! Very sweet and very pretty! Your work is coming along nicely! OMG Kerri!! This is too sweet girl!! LOVE IT!!! This is the most beautiful Halloween card I've ever seen! Fantastic coloring! Beautiful! Now if this little girl came to my door I would give her the whole bowl of candy (unlike the horrible gross costumes they wear anymore) I digress.... Beautiful coloring and I like the flowers. Wonderful creation. 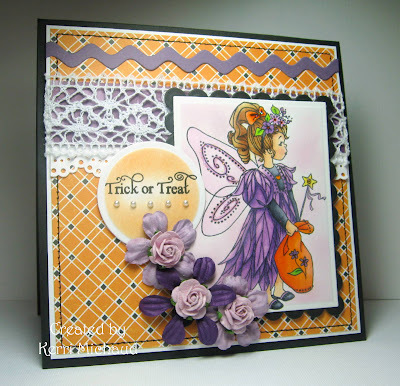 Look at all that purple on a HALLOWEEN card!! And those purple Primas are sooo pretty. The softened up girly Halloween look is fantastic!